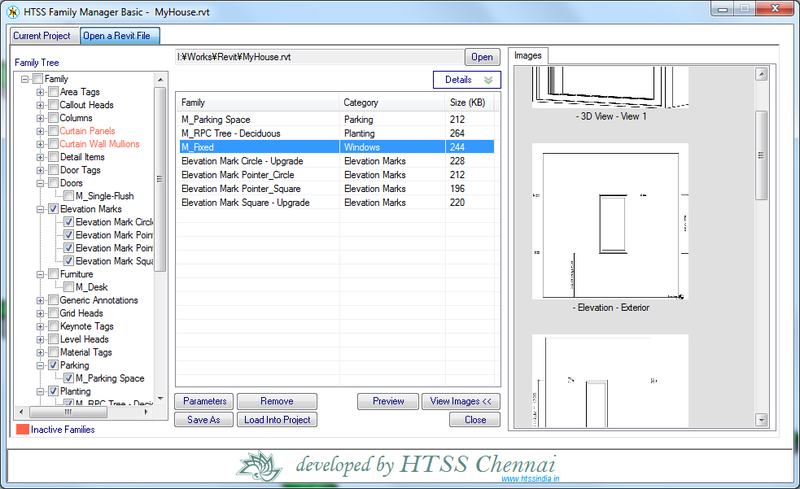 The purpose of this tool is to directly load families from one Revit project to another i.e., this tool enables the users to easily look in to the views, types, parameters of the families in a Revit project file and directly load the selected families in to the current Revit project or save them as ‘rfa’ files in the given PC path. 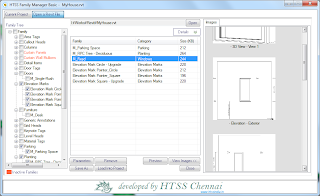 All the families of a Revit file can be viewed in one place and they are also grouped under their corresponding Category and Sub-Category. The legacy families (which can’t be edited in Revit) are highlighted with separate color code. Options are available to see the thumbnails of all the views in a family. The types and their parameters of a family can also be viewed at a single click. The families can be previewed as real Revit project without opening them in Revit. The selected families can be saved in your PC. The required families can be directly loaded in to the current Revit project. Only the non-legacy families can be handled (previewed, loaded or saved) using this tool.